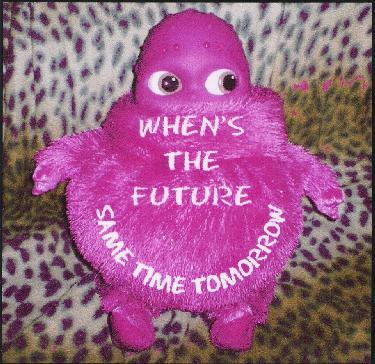 When's The Future - "Same Time Tomorrow"
When's the Future is a side project of festie band Krom Lek. I only heard a few tracks from the first When's the Future album, and that one seemed to get away from the festie vibe for more of a mind-melting space rock sound. So it's with kind of a surprise that they take a completely different direction on this disc. Delving into techno and jungle rhythms a la Eat Static, the group instead layers them with not only ambient textures, but psychedelic rock sounds as well. But rather than the endless repetition that a lot of techno tends to get into, When's the Future are constantly shifting and changing the sound and dynamics of each piece, layering in different samples, and overlaying poly rhythms, even in a shorter track like the 3-minute long Toga-Larone. Other tracks explore different aspects, with a varying psychedelic approach. Yin Tang Meringue and Ground Zero have a bit of Eastern feel to them, the latter especially sounding not unlike some of the mellower moments of Ozric Tentacles. Funky organ weaves in and out through the pulsing rhythms and beats of Vague Mutterings. And there's some nice looping of melting, acid guitar on Choroid Plexus. And the brief Going Up even throws in some heavy metal guitar riffing! Besides the Ozrics and Eat Static, I hear a bit of Ozric's side project Nodens Ictus, dashes of Future Sound of London, and of course, a dose of Krom Lek themselves in there as well. But that can only be the suggestive comparisons. When's the Future take a somewhat tired genre and reinvigorate it with new sounds and ideas. For more information you can visit the Stone Premonitions web site at: http://aural-innovations.com/stonepremonitions.